Landstuhl Regional Medical Center Germany. Left to right George Thornton, CEO National Wild Turkey Federation, Jerry Martin, Bass Pro Shops TV Host, Michael Waddell, National Wild Turkey Federation Spokesman, A proud American Soldier, retired Major General Randy “Grits” West USMC, Ryan Klesko, former Professional Baseball Player, and Jim Zumbo, outdor TV personality. “These are the times that try men’s souls: The summer soldier and the sunshine patriot will, in this crisis, shrink from the service of his country; but he that stands by it now, deserves the love and thanks of man and woman,” The American Crisis, Thomas Paine. Go by The National Wild Turkey Federation Campus and ask George Thornton what the words above, written 236 years ago, mean to him. George will very likely pull out the photo above and tell you about his recent visit to Landstuhl Regional Medical Center near Frankfurt, Germany, enroute to Southwest Asia (more about enroute later). George and the others standing beside the young troop in the hospital bed were there to thank those that continue to stand by their country when souls are tried and from the conversation I recently had with him the visit certainly touched his heart. “We talked with a soldier, a severe burn victim, who came through the center eight years ago as a patient and was mentored by another patient. 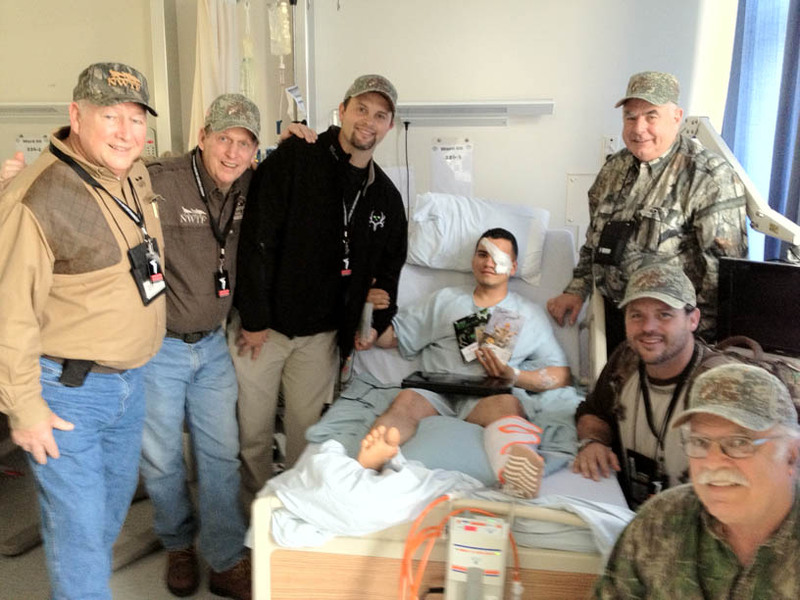 After his extensive treatment, he dedicated his remaining service to mentoring patients,” shared the outdoorsman. As he told me about this encounter with the dedicated soldier his voice would break on occasion and I could sense that his eyes were glistening from the moisture of tears being stifled. I am glad this man’s character came out early in our conversation. It did not take long to know that George Thornton really cares. He went on to tell of meeting with a father and son reunited in Landstul shortly after the lad fell victim to an IED attack in Afghanistan. “This was his only son,” said George as he went on to describe his experience as one of sadness and thankfulness. “Sorrow that the world has not progressed beyond conflict and combat. Thankfulness that we live in a time –and in a country–that has the best medical technology and resources to care for the people who protect us.” The conversation moved on at this point but George would re-visit Landstul a number of times as the morning progressed. The third day into this odyssey the Wild Turkey Federation’s head man found himself in a desert somewhere very far from Columbus, Georgia, where he grew up and sitting out there with him were some other folks from almost as exotic surrounds as Southwest Georgia. There was Michael Waddell from Booger Bottom, Georgia, Ryan Klesko from a very different desert, Jim Zumbo from just north of New York City, Jerry Martin who went to college in a desert and Randy West who had been where they were before. George tells me all of them are famous outdoorsmen except him. So one might ask what are these famous outdoor people doing in Southwest Asia instead of Southwest Georgia. They were the guests of the Department of Defense’s Armed Forces Entertainment, whose mission is to provide entertainment to troops around the world. All were told that this tour was the first of its kind in that they would be on the ground, meeting one-on-one with servicemen. According to George they all felt a great sense of responsibility to carry the best wishes of their fellow countrymen to sailors, soldiers, airmen and Marines serving overseas. “They all miss home and the opportunity to be in the field with family and friends,” reflected George. The mission was to travel to a military hospital and forward bases to express the gratitude of all Americans to those who defend our freedom and keep harm away from our shores. A lot of young Americans believe that George Thornton, CEO National Wild Turkey Federation, Ryan Klesko, former Major League Baseball player, Michael Waddell, National Wild Turkey Federation spokesman, Jim Zumbo, outdoor TV personality, Jerry Martin Bass Pro Shops TV host and the man that commanded the liberation of Kuwait under General Norman Swartkopf in Desert Storm, Major General Randy “Grits” West accomplished their mission. 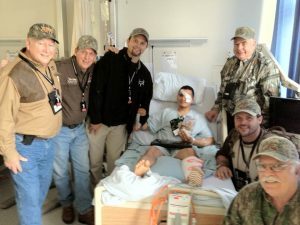 George Thornton’s blog post from the trip can be found on the NWTF web site.